﻿ Fairmont Jaipur Hotel (India) | FROM $73 - SAVE ON AGODA! "One of the best place to stay in Jaipur, Breakfast is really..."
Have a question for Fairmont Jaipur Hotel? "The entire estate with its service staff was impeccable." "Everything in this hotel is excellent." "Services is exceptional especially staffs." 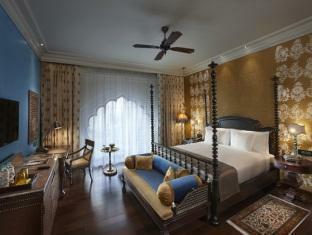 In the quiet recesses of Kukas, Jaipur, lies an oasis of luxury, Fairmont Jaipur. Gleaming under the watchful eyes of the Aravalli hills, glittering with history and culture of Rajasthan, the hotel is a living palace that gracefully combines the glories of the past with modern day comforts. 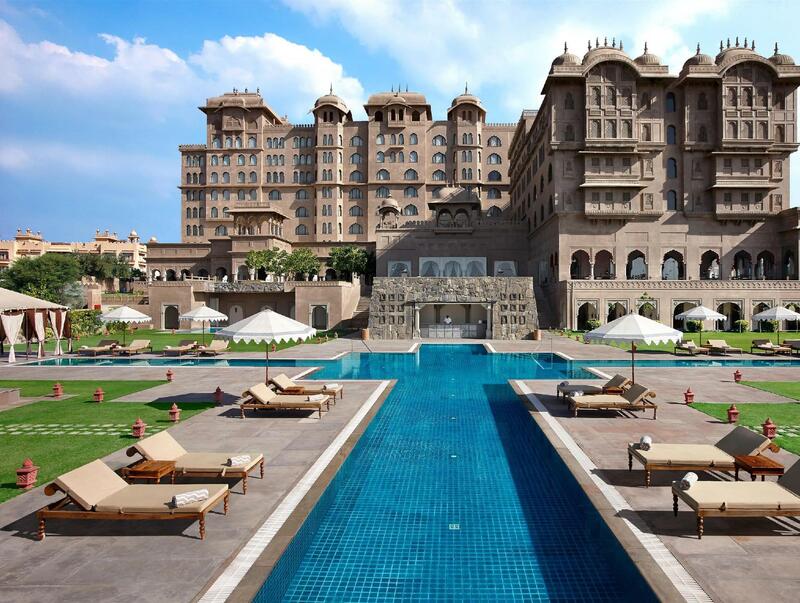 The story of Fairmont Jaipur inspires a vision of timeless hospitality, and Fairmont invites guests to join them in imagining a place that is steeped in a rich and privileged heritage, yet is effortlessly modern. Every aspect of the hotel, the architecture, the layout, the décor, the hospitality has been inspired by the legends of two of India’s most celebrated rulers – the Mughals and the Rajputs. Guest Rooms at Fairmont Jaipur are bespoke residences that exude classic heritage influences with four poster beds, camel bone inlaid furniture, walk-in bathrooms with the distinct pink city stone bath tubs. The opulent accommodation is complemented with an array of eclectic dining options, from the vibrant and energetic Zoya, all day dining restaurant, with a special emphasis on authentic Rajasthani cuisine, the regal Zarin, which celebrates the fusion of Indian and Persian cuisine, the charming Anjum, where Fairmont's internationally celebrated tea drinking culture comes to India with an exciting local twist, to the elegant Aza, library bar for a quiet evening of aperitifs and signature cocktails, to the spectacular rooftop restaurant Asmaa, which offers Raj Era cuisine. "Got a free upgrade, room was huge and very luxurious." A wonderful and one-in-a-lifetime experience to stay in this hotel. The only thing about the this place is that it is a bit further away from the main shopping area. Other than that, it is a wonderful place to stay. The staffs are friendly. The real great thing is the use of plastic in the entire hotel is at minimum level which is great for out environment. The Gold Room gives u feel of a royal as the entire room is designed like a palace . And the use of silver in some places adds to that feel. A must for one to experience the stay . 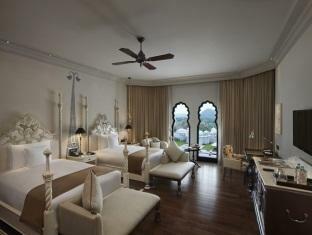 Exquisite bedroom with tasteful furnishings, Lavish bathrooms and royal welcome make you nothing less than royalty. Facilities for kids to play and friendly caring staff. Food quality and spread needs to be improved. Our stay was good. Upon arrival, we were given a warm welcome. Reception staff was very cooperative n friendly. Hotel is good but lighting is very dim. Cleanliness could be improved. Overall everything is good. Staff is very friendly. Rooms are good n spacious. Almost everything about this hotel is beyond expectation. I spent my last day in India in this hotel, after 2 weeks of travelling in India. Among the 7 hotels that I had stayed during my trip, this hotel is the best. From the moment I step into this hotel, the staffs made me so welcome and appreciated. The ambiance was really nice and almost magical too. However, among the 7 hotels, this hotel is the only hotel that does not offers complimentary wifi. I had to pay 200 rupees ( excludes service charge&gst) for 1 hour of wifi. Pros: facilities are great; great "palace experience" with drumming and flowers when you arrive; great breakfast and restaurant. Cons: torn duvet cover; missing hair dryer. Dear Ms. Luiz, We sincerely appreciate you taking the time to write and post a review on Agoda. We are very pleased to know that you appreciated the overall facilities and your culinary experience at our hotel. We are sure that this feedback will serve as an encouragement to all of our staff as we strive to continuously improve the quality of our services. Your feedback on the hair dryer and Duvet in the room have been shared with our Director of rooms for her to review and address your valuable inputs. We would like to express our sincere appeasing sentiments to you for your experience coming up short with respect to your expectations. However your observations and feedback have been duly noted noted for necessary steps to be taken. It was certainly a pleasure having you stay with us at Fairmont Jaipur and the team eagerly await your return. Thank you & Regards Team Fairmont Jaipur. We had a short one night stay at Fairmont, and it turned out to be the best, during our trip. We were welcomed with the beat of drums and shower of rose petals from above. The palatial hotel gave quite a royal ambience. Our check in was smooth, handled by Uttam, who also gave us an orientation of the place and guided us. Our room was beautifully decorated by Shikha and Hitesh for the special occassion. We enjoyed the folk dance and music that played in the lobby in the morning and evening. Gurwinder Singh , the restaurant manager was very warm and cordial, and went out of the way to make the stay memorable for us. A private candle light , birthday dinner was arranged for us. The chocolate cake was one of the best that we had. Sanjit and Bharti did a great job and made the evening special for us , with their decoration and recommendation of delicious dishes. We thouroughly enjoyed the evening and had a very comfortable stay . The entire estate with its service staff was impeccable. The rooms are big with toilets fit for a king. The pools were amazingly huge, complete with a bar and oversized floats! I loved my stay. It’s the best hotel in Jaipur. Dear Guest, We want to start by conveying our sincerest appreciation for communicating such expressions of adoration for the various attributes of the palace hotel and its colleagues. Fairmont Jaipur is a luxurious royal hotel away from the hustle bustle of the city where each colleague strives to create beautiful memories for our guests. Your kind words of admiration have been duly shared with the team & go along in expressing their immense gratitude for the same. Do visit us again soon! Thank You, Kind Regards, Team Fairmont Jaipur . We took a holiday after 18 months, so I dare say it was an important one for us. But travelling with a 9 month old comes with its own set of issues. Our daughter fell ill on the first day so we had to get medicines from the city (30-40 kms away), her diet had to be amended based on what the doc said and we weren't carrying any of that with us. But the hotel staff assured us that we were in safe hands - and I can now vouch for that with so much gratitude. The entire staffs stepped us , met all our requirements 24 x 7 with nothing but smiles , kept checking on us and the well being of our baby. Made sure everything was made easier and we honestly forgot all our issues and had a wonderful time enjoying the splendid property and the warm n welcoming hospitality. I would recommend this highly and compliment the team for world class service levels. a little outside of the main attraction in Jaipur but definitely worth it. Gorgeous hotel & great staff! Although we did have to move rooms because a large wedding party was making so much noise and in the move my pyjamas got lost and were never found... Other than that we were very impressed, first trip to India and will definitely not be our last! Location is good, not too far from tourist attraction, Hotel are very clean, staff are super nice, the food is super! too bad we still have to pay for internet connection, apparently we don't have free wifi in our room and all hotel area. The warm welcome since the front door to the check in... Delicious and many selections for your breakfast and dinner. Beautiful palace with spectacular view even it was foggy in the morning. Recommend especially for Gold room where will make you never wanted to leave hotel. Great property, as its outside Jaipur city which escapes one from city noise and traffic me and my family were relaxed. The staff is efficient and courteous. Tried their Persian resturant and Mr Dinesh (supervisor of all resturants) recommended couple of dishes which turned out to be right choice. Overall it was a pleasent holiday. The Hotel is amazing with a pleasant atmosphere bringing you back to the previous maraca times. Staff is kind and careful to all guests needs.. feed is delicious. They prepared for me gluten free muffins for breakfast. Rohan the driver I had was incredibly gentle and available to drive me in different locations of the City. I truly reccomand him. It's way beyond our expectation. It was my fiancé birthday celebration and we decided to celebrate it in India. The service that was given to us is excellent especially the front desk staff who is very efficient (forgot the name though). I didnt say a lot of words but when I told him its my fiancé's birthday on that day he immeditely thought of something special to prepare for him. I greatly appreciate the effort of pulling off a surprise birthday arrangement in the room and on our dinner table too. The only problem we had was on our last day, there was a short circuit on our room that we didn't notice cause we were comfortably sleeping. That incident cause the lights, aircon, and all socket to malfunction and with India weather this time of the year we felt like we were steaming so we immediately called reception to report the incident and they manage to send the maintenance to look and into it.